For many dancers, you spend all day at school before heading to the dance studio for an evening of dancing. 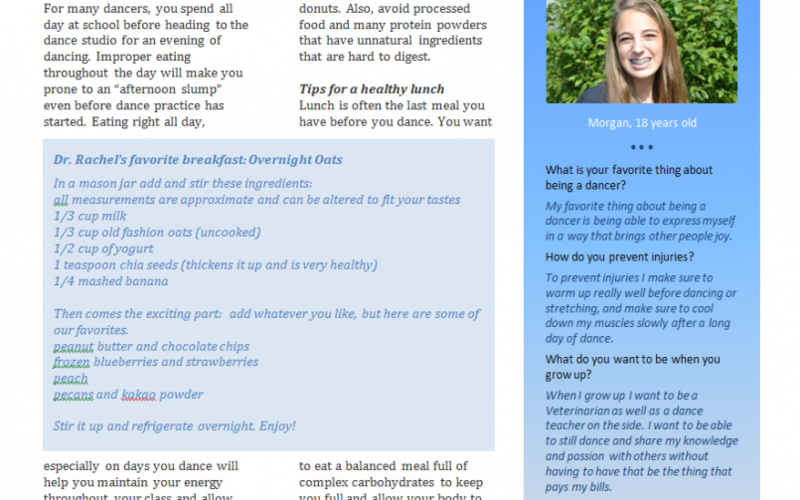 Improper eating throughout the day will make you prone to an “afternoon slump” even before dance practice has started. Eating right all day, especially on days you dance will help you maintain your energy throughout your class and allow your body to properly repair after a long day. Breakfast is hard for most people, so find a quick and easy meal that you can grab to eat quickly at home or take to eat on the way to school. Combine proteins and complex carbohydrates to keep you full and focused. Avoid sugary foods like many smoothies that are not made at home, pastries, or donuts. Also, avoid processed food and many protein powders that have unnatural ingredients that are hard to digest. About an hour before you dance is the perfect time for a small healthy snack high in fiber, protein, and complex carbohydrates to keep you feeling energized without being too heavy. Sugary high-fat snacks are easy to grab on the go, but will make you feel sluggish while dancing and can cause cramping. Avoid candy bars, cookies, potato chips, and French fries. Even some granola bars are full of sugar and provide little nutrition. After a strenuous workout, overworked muscles need protein to repair fibers and prevent soreness. Hydrate, hydrate, hydrate! Water is best. Beware of most sports drinks and energy drinks as they are also full of sugar, and the caffeine in energy drinks can affect your sleep. Avoid skipping meals. Dancers burn a lot of calories in class which should be replenished with healthy nutrients to get the best out of class.